No forms to complete, no labels to peel and stick, no software to download or install! Address letters quickly, track Certified Mail, print delivery receipts and more online! 1. Address your letter on our website then print the address cover page on your local printer using plain white paper. Send 1 letter or 10,000! 2. Insert the address page in our Certified Mail Envelope with your letter or papers behind it. 3. Apply/verify postage, and enter into the USPS mail stream. These Certified Mail Envelopes are pre-approved by USPS and include 'in-route' tracking scans and Electronic Delivery Confirmation and Signatures (RRE) from USPS to provide proof of delivery. No more forms or peel-and-stick labels to purchase. No software to buy or maintain. The Certified Mail Envelope solution provides electronic activation of each USPS Certified Mail article number and 'in-transit' USPS letter tracking scans including Electronic Delivery Confirmation from the United States Postal Service. Our Certified Mail solutions were designed to save you time and money. 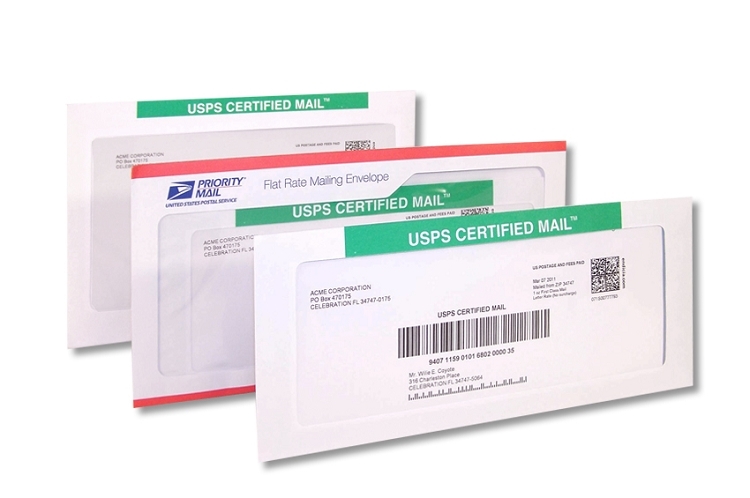 Certified Mail Envelopes do not require written forms or Certified Mail laser forms or labels. Our Certified Mail Envelopes utilize web-based software that will address and print USPS Certified Mail article numbers and bar codes for tracking Certified Mail. You simply print the address information on your local printer using plain white paper. Insert the address page into the Certified Mail window envelope, place your letter behind it, and drop it in the mail. No hand-written forms or labels are used in our patented process. We support USPS Certified Mail Return Receipt Requested service with Electronic Return Receipts & optional Signatures (RRE) returned to you automatically as a PDF file. Commercial mailers can use our Enterprise solution to automate the process and mail 10,000 letters or 500,000 letters at a time. We can provide USPS Certified Mail automated solutions for business communications, regulatory, compliance and pharmaceutical fulfillment. Our USPS Certified Mail transactional communications provides same-day printing and USPS mail entry and meet ‘HIPA’ compliant regulations. Skip the trip to the Post Office – Save Time! No forms or labels to complete by hand – Save in labor costs! No monthly fees or contracts – Pay only for what you mail. Eliminate green card filing – All tracking data and reports are stored securely for 7 years!